Submitted by jaxler12 on March 6, 2015 – 12:29pm. So after reading so many rave reviews about breads using Spelt I decided it was time to give the ancient flour a shot. Since this was my first attempt and I’m kind of a wimp I decided to go with 75% spelt instead of 100%. The rest of the formula is as follows. Wednesday 8:30pm–Combined both flours. Dissolved starter into water. With dough scraper I combined water/starter mixture and flour until I have a shaggy mass and leave in my Kitchenmaid bowl. I covered with a towel and autolyse for 20 minutes. Wednesday 9pm–Add salt gradually, stretching and folding directly in bowl. Once salt was mixed into dough I remove from bowl and give it a few slap and folds. I formed into a ball and left it on bench covering with the bowl. Wednesday 9:30pm–First “true” stretch and fold. Wednesday 11pm–Last S&F and then put into plastic container. Placed in 50F fridge for 17.25 hours. Thursday 4:15pm–Pulled dough out of fridge and took out of plastic container. Preshaped dough into a ball and let rest for 15 min. Thursday 4:30pm–Shaped into a batard and placed in couche. Preheated oven to 500F with baking stone on bottom rack and cast iron on bottom deck. Thursday 6:35pm–Scored dough and spritzed with water. Loaded dough onto baking stone and poured boiling water into cast iron to produce steam. Thursday 6:40pm–After 5 minutes I gave the dough another spritz of water for more steam. Thursday 6:47pm–After 12 minutes at 500F I lowered temperature to 450F and removed cast iron. 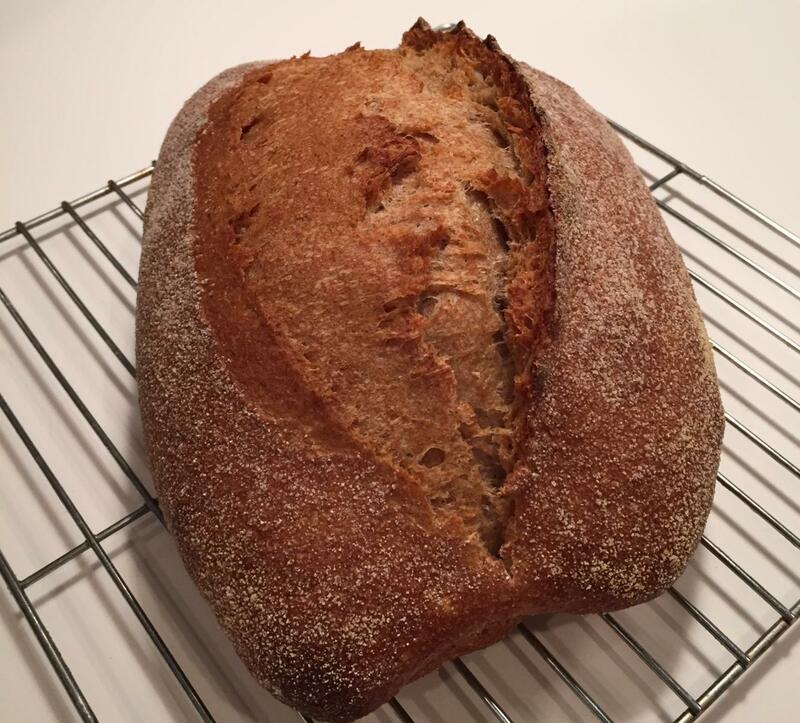 Thursday 7:07pm–After 32 minutes in oven I took temperature of bread. Temperature read 210F. Placed bread back on stone and turned off the oven and propped open the door. Left bread in oven for another 5 minutes with door open. Friday 7:30am–Cut bread and had a slice before work. 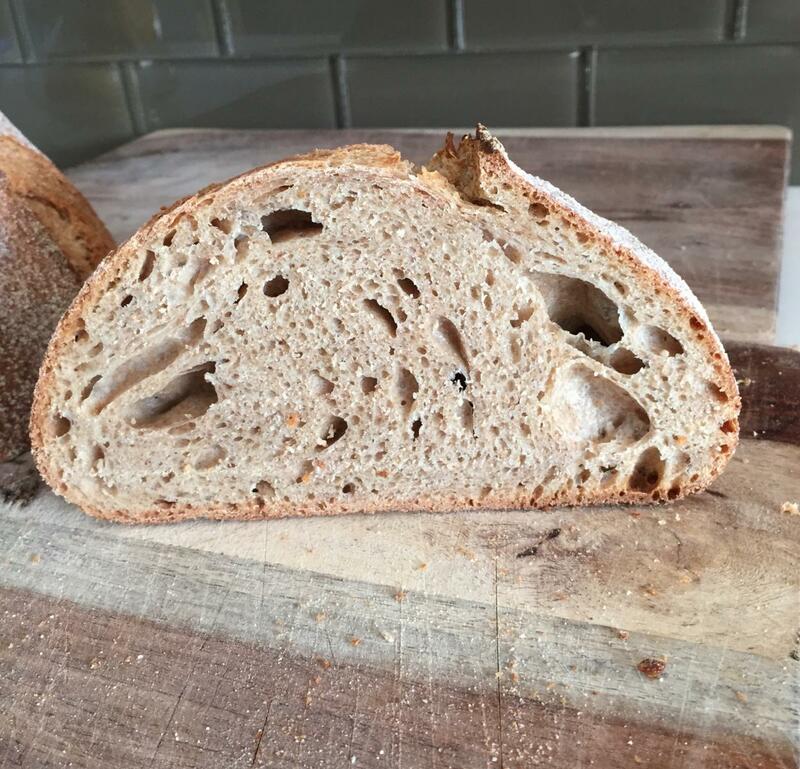 Bread was somewhat denser than I would’ve liked, but I think that has to do with the fact that it was underproofed (See crumb in photos below). Usually I use around 20% starter and this time around I switched it to 15%. Of course I forgot about that, which explains me jumping the gun and loading it earlier than I should’ve. I also used a new shaping technique so I’m not exactly sure how that effected the dough. Flavor was good though. The earthiness that I’ve heard spelt gives was definitely apparent and it wasn’t as sour as I thought it might be after such a lengthy fermentation. All in all I think it was a good first attempt and I’ll be revisiting this recipe soon enough in order to perfect it. Any suggestions on how to get the most out of spelt would be greatly appreciated.